On Pack Promotion is a phrase that will prick up the ears of marketeers. They are an exceptional way to make your product stand out among the saturated shelves of the standard store. 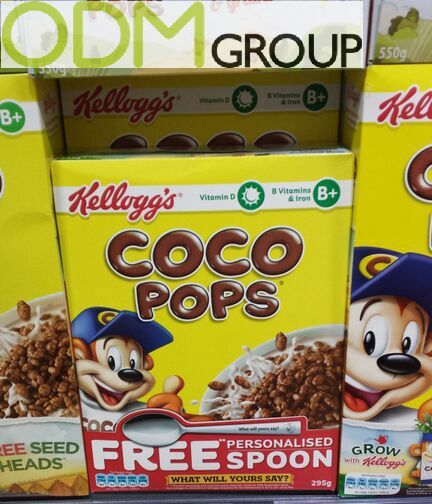 This case by Kellogg’s with a free custom promotional item of a spoon, on the front of the coco pops package, is a great example of an on pack promotion. In addition to making your product stand out on the shelf, an on pack promotion brings competitive advantage in a plethora of ways. The promotion, used alongside gifts with purchase also adds value to the purchase for your consumer. This leads to increased profitability for the product. 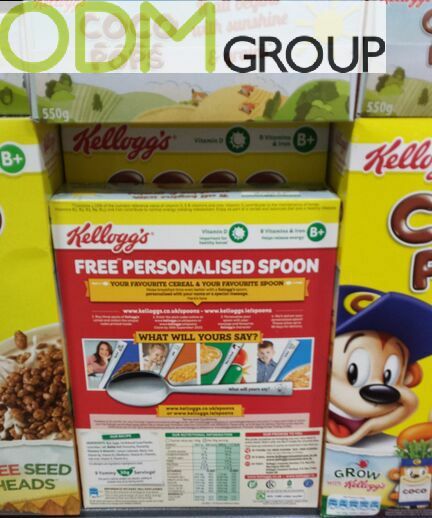 Even better in this case is the fact that Kellogg’s have gone with a personalized spoon. Custom gifts like this are a great way of below the line marketing, grabbing the attention of your potential consumers. But the benefits of an on pack promotion do not end here. Customer Retention – Perhaps a less obvious benefit, when consumers are delighted with their purchase, they are certainly more likely to return to you as a consumer. In this case by Coco pops, they are undoubtedly likely to delight their consumers by offering this gift with purchase, exquisitely advertised using an on pack promotion. Pester Power – In this case especially, an effective on pack promotion utilizes the potential of pester power. Children will see a great on pack promotion, especially one with a gift with purchase, and increase the chance of sale through their childlike negotiation tactics. The benefits of an effective on pack promotion like this are profound. As outlined they certainly increase the profitability of the product offered. ODM have great experience with On Pack Promotions. To find out more you can visit our blog for inspiration, and contact us if needed.